Your values are the things you believe in and which you think are important. Every person has their own value system which has been influenced by their background and their philosophy of life. Some jobs give you a chance to express what you believe. Other jobs may go against certain values. There is such a strong link between jobs and lifestyle! The things you value in your lifestyle – income, location, free time, etc. – play an important part in your career choice. Such a job will interest and motivate you far more than any job which goes against your values. There are 30 different “values” shown below… there are a lot more! Look at the values (above) you said were very important to you. Which TEN are the MOST important? Rank them in order of importance from 1 to 10. Look at the ones you marked as UNimportant. Which ones are of LEAST importance? Can you name five jobs you just could NOT do because of what you believe? How important is it to do a job which satisfies your values? Is it important to make sure jobs do NOT match your “least important” values? 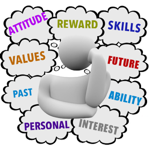 Think about what rewards / satisfactions the following people might get from their work. What type of values do they appeal to? What type of person might do this type of job? How important are Values in the Workplace?